Eggs are a staple food for most Americans, which is no surprise, considering how necessary they are in savory and sweet recipes alike. On their own, they're usually not too eggs-citing. However, these clever egg hacks will make your egg-making easier, more fun, and more interesting. You can make these easy heart-shaped hard-boiled eggs easily with some cardboard, rubber bands, and a chopstick. Watch the video from Dav Hax below, or check out Yumi's illustrated guide for instructions. Who knew you could peel hard-boiled eggs perfectly in a glass of water? It's quick, clean, and easy. And you can do it with more than one egg! One of the easiest, simplest ways to separate yolks from egg whites for recipes such as microwave meringues is using the water bottle method. 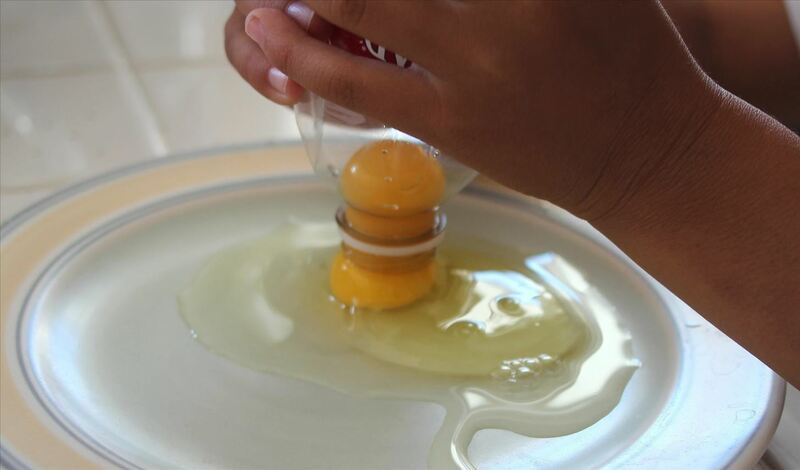 Gently squeeze an empty plastic bottle, place its mouth on top of the yolk(s), and then slightly releasing your grip so that the yolk(s) gets sucked up inside the empty bottle. Click here for more info on this method. 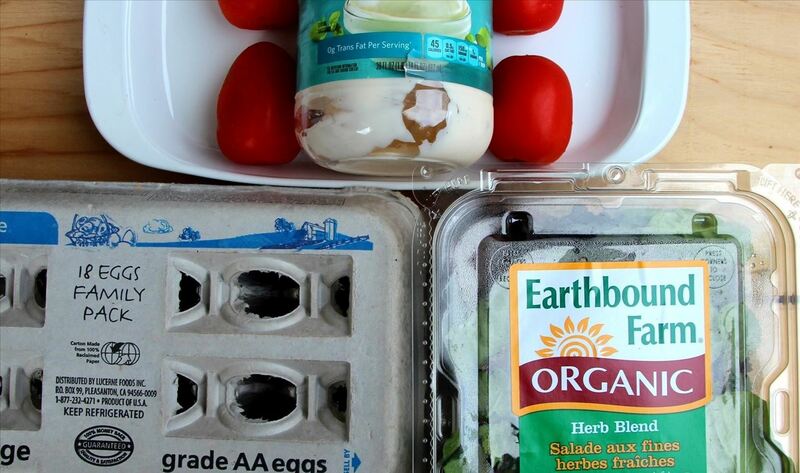 All you need to make a woodland-themed salad are some greens, hard-boiled eggs, Roma tomatoes, and mayonnaise, plus your favorite dressing on the side. Cut the hard-boiled eggs in half, and cut a thin slice from the bottom of the rounded ends so that the tomato halves can balance. Cut the Roma tomatoes in half, and place them on top of the eggs. 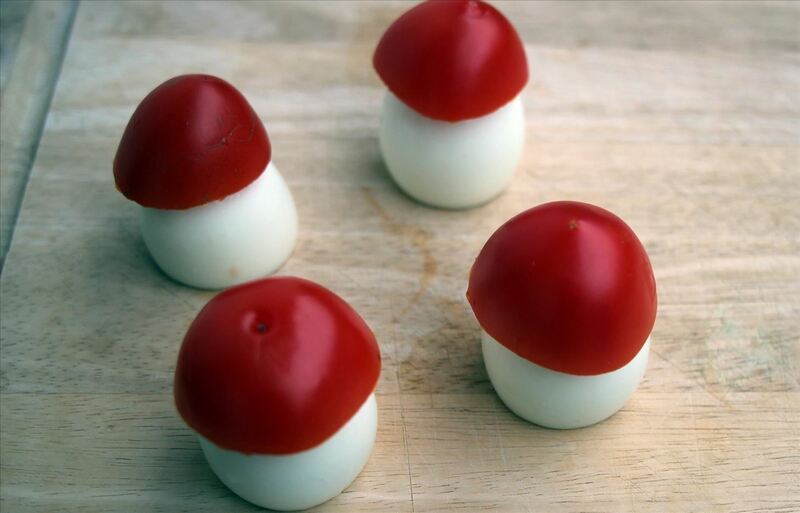 Using a toothpick or chopstick, make dots on the tomato mushroom top with the mayonnaise. 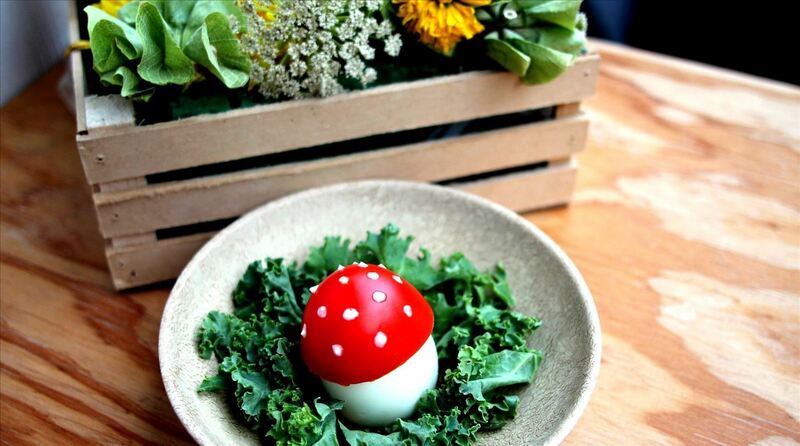 Place your "mushrooms" on a bed of kale or other greens. Serve dressing separately and let your guests enjoy! 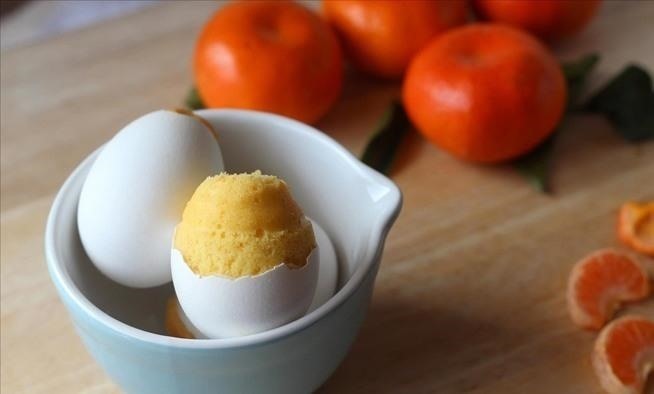 Perfect for Easter, tea parties, or even April Fool's Day, it's actually easy to make cake in eggshells by piping cake batter into emptied eggshells. Get the full tutorial here. 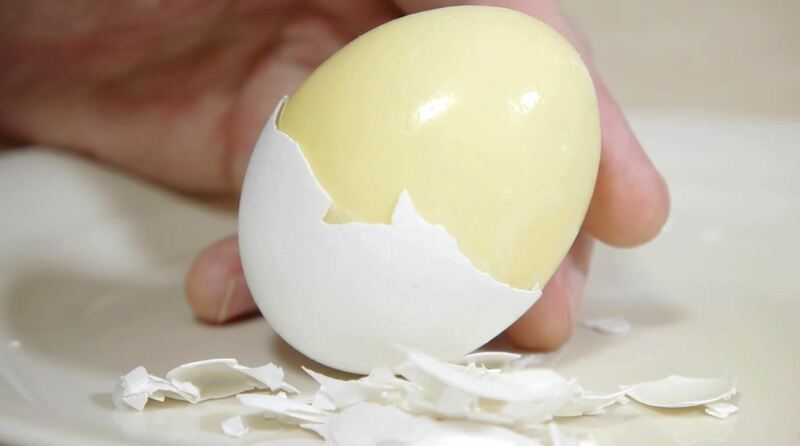 This awesome trick scrambles eggs inside the shell, and just requires eggs and stockings. You place the egg inside the stocking, twist both ends tightly many times, and then pull the ends out so that the egg spins before you boil them. The complete how-to is available here. 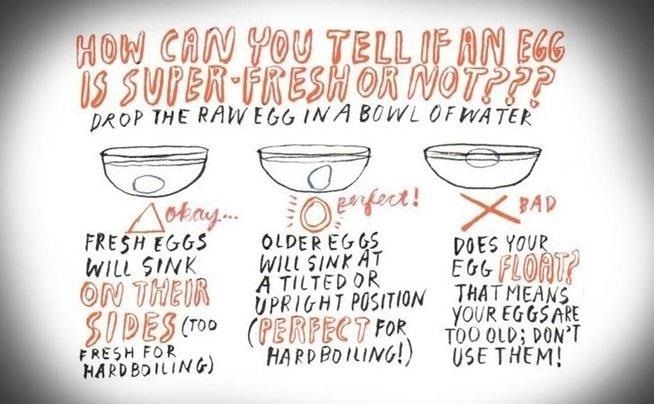 An easy way to see if your eggs are good is to float them in a bowl of water. If they rise to the top, they're old—don't eat them. More info on this and other methods (including getting the Julian date) to see if your eggs are truly expired is right here. 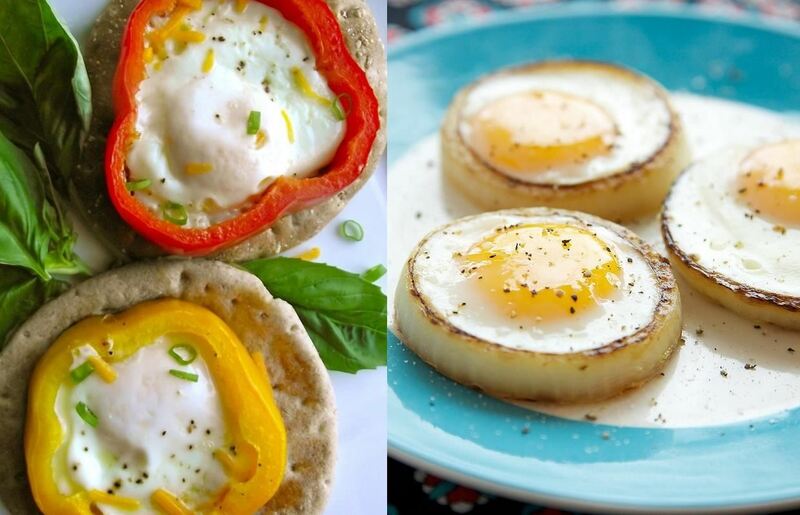 Use colorful sliced peppers and sliced onion rings to shape and flavor your fried eggs. Frying your eggs inside the veggies also make a healthier, prettier breakfast. Avocados and mushrooms are also nice options. Read more about it here. 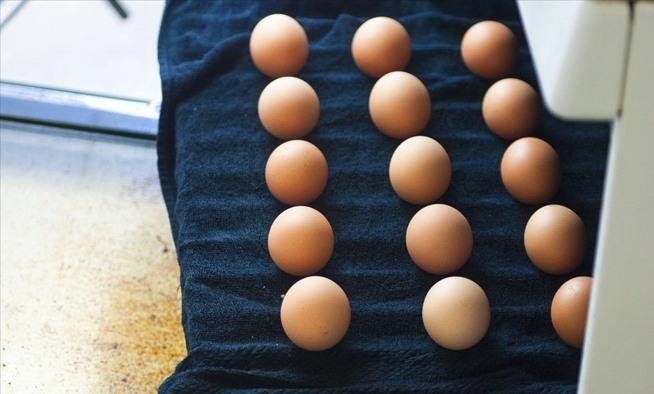 You can make a lot of hard-boiled eggs at once in your oven. Nestle the eggs on a wet towel on your oven rack and bake for 30 minutes at 320°F. Get the full how-to here. Use your waffle iron with the lid up to create cool-looking square eggs, or go lid down for quick and easy scrambled eggs. 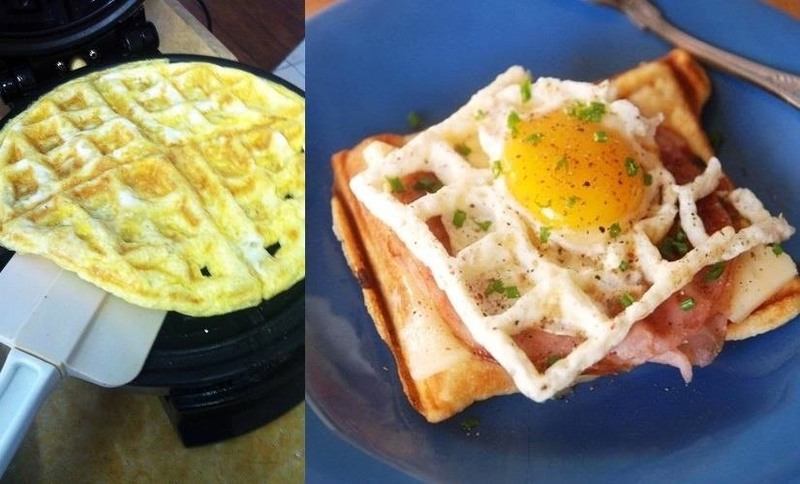 You can find instructions, as well as more cool waffle iron hacks, right here. Not Enough Egg Hacks for You? Then try some of these on for size.